Celebrate with fancy nonalcoholic beverages. It’s a new year! For many, celebrating in 2017 need not include alcohol. Abstaining can be easy with these fine mocktails and other alcohol-free beverages—all satisfying and delicious. The mocktail proves a party can thrive without spirits. With the right approach, mocktails are every bit as festive as their spirited brethren. Housemade syrups, fresh-squeezed juices, distinctive glasses and eye-catching garnishes fashion into concoctions worthy of a grand celebration or a well-deserved splurge. Nonalcoholic beverages range from sweet to savory and are every bit as enjoyable as alcoholic drinks. The virgin Mary sacrifices no flavor compared to its boozy original. On the lighter side, fizzy fruit-flavored blends combine mouthwatering flavors with beautiful looks. Maybe you want to go healthier with fresh-squeezed juice, filtered water or antioxidant-rich green tea. Nonalcoholic drinks can supplement a meal on every level. Say goodbye to the premise that no alcohol means no fun. Cheers to non-alcoholic drinks! The many merits of a mocktail are exemplified in the virgin Mary. It soothes the tummy with a savory, salty smack, and the tomato juice base is nutritious. Tavern on France does an indulgent spin on the namesake nonalcoholic drink. On the weekends, you can build your own virgin Mary that starts with a zesty housemade mix. The bartender puts the drink together, but you pick the garnishes. How about some celery, banana peppers, pickled asparagus, pickled corn, cheese (pepper jack or cheddar), olive, lime or a beef stick? Whew! General manager Emily Mendoza says while she’s seen guests select up to seven garnishes, “They tend not to go too crazy.” With so many hearty flavors, the lack of alcohol is not evident. $8, $3.50 on Sundays. For a drink so darn cute it almost chirps a peep, head over to Café Maude. The ever-popular rubber ducky showcases a Peep over a Technicolor vertical pool of blue raspberry lemonade. The legendary confection makes an ideal garnish: It floats, it adheres to glass and its fanciful marshmallow shape delights everyone. 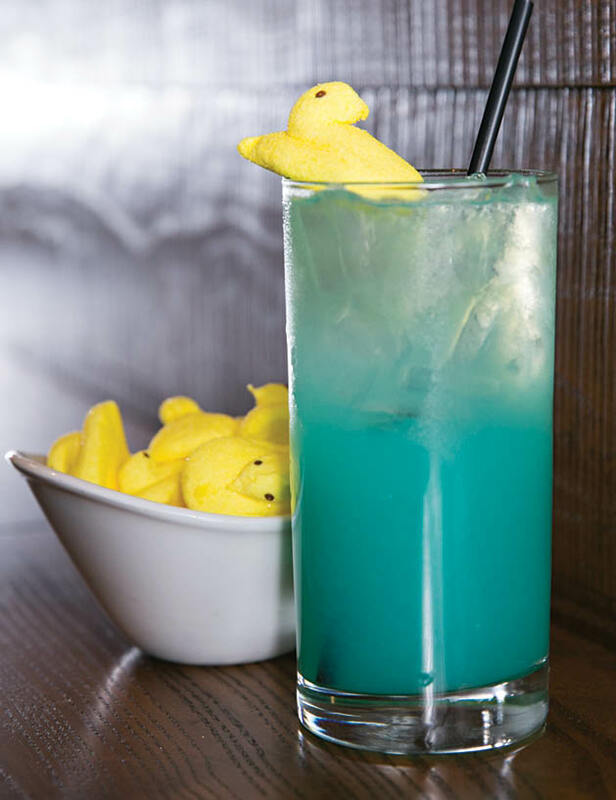 Take one look at this sky-blue drink adorned with a puffy Peep and you’ll feel “comically pleased and amused,” says general manager Todd Staberg. While kids do order the rubber ducky, the drink is more popular with adults. (Some request a shot of vodka.) This mocktail, like all of Café Maude’s cocktails, is a hand-crafted blend using quality ingredients. Staberg says the rubber ducky would be hard to replicate at home because the blue raspberry syrup is hard to find. $4, vodka add $3.25. Fizz is fun! Carbonated water and white cranberry juice invigorate a cranberry and strawberry sparkler. Top-shelf ingredients combine into a rare fusion. A shake of fresh-squeezed ruby red grapefruit and lemon, plus strawberry purée, are topped with carbonated water. The resulting pale bubbles resemble champagne on the rocks. “It hits all the senses with the cranberry juice, grapefruit and the strawberry,” says McCormick & Schmick’s beverage operations manager Amy Morgan-Parham. A mixologist created the winning concoction. This elegant refresher ranks as one of the top-selling hand-crafted nonalcoholic drinks (only outplayed by the Arnold Palmer and other lemonades). “It’s a great alternative for those, especially at lunch time, who still want a unique handmade cocktail but not with alcohol or spirits,” she adds. $6, refill $1.25. For another ginger refreshment, try Big Bowl’s fresh ginger ale, one part soda pop, one part hand-crafted cocktail, and all delicious. This is nothing like your typical canned ginger ale. An intense spicy pep emerges from luscious housemade ginger syrup. For some added fruity punch, go for the orange or pomegranate version. All of the fresh-made ginger ales have sweet and sour notes that complement the pungency of Asian cuisine. Take a whiff; the floral fragrance tingles. $3.50-$3.95. Get the skinny on nonalcoholic drinks that are deliciously healthy. At Agra Culture, you’ll find loads of nutritious fresh juice blends. Aptly named, the skinny drink looks the part, with a pea-green froth that resembles whipped salad in a glass. A pleasant tasting 16-ounce portion can keep you happily charged without guilt. “The word’s ‘skinny.’ Who doesn’t want to drink that?” says Aaron Switz, founder and CEO. A savory blend of spinach and cucumber gleams with a warm kick from fresh ginger. Sweetness lingers from mango and lemon. Filtered alkaline water—touted as a remedy against toxins in the body and as a promoter of better health—balances the blend. $6.50. While hot green tea is no mocktail, the beverage is too popular not to mention. Green tea is one of the most widely consumed drinks worldwide. Most often it is enjoyed hot. In Japan, green tea’s importance reaches back centuries. You can glimpse this grandeur at Nakamori. With luck, you’ll receive your tea in an authentic Japanese teapot. An ornately decorated white porcelain teapot with an accompanying handle-less tea cup exemplifies the regal ceremony of old Japan. Gently pour-and take a sip. You won’t burn your fingers. Green tea is brewed at a lower temperature than black. Smell the exotic aroma and anticipate the next taste. Nakamori’s special blend contains brown rice. The tea’s subtle vegetal flavors are just right for sushi. $2 cup.